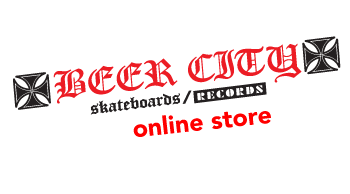 The Faction - "Dark Room" 12"
BEER CITY SKATEBOARDS AND RECORDS is proud to reissue THE FACTION - Dark Room 12”. This is the fourth FACTION record ever released. Originally coming out in 1985 and limited to 5000 copies. This reissue has been restored and remastered for a louder, better sound then ever before! The cover of this record was done by former pro skater and artist Ken Sigafoos. The Back cover illustration was done by pro skater/artist Lance Mountain. A sick inner sleeve comes complete with lyrics is also included! To top it all off only 1500 of these will be pressed and on translucent red vinyl for RSD 2016. Featuring legendary pro skater (and founding member) Steve Caballero! Hear THE FACTION blaze through 7 classic songs that helped to define what would become known as Skate Rock. Just give this a listen and you can hear why THE FACTION is legendary and a pioneer of the Skate Rock genre. This is the band that was on the Skate Rock cassettes. This is the band that’s song “Skate and Destroy” was in the opening of the first Bones Brigade skateboard video. This is the band name and logo 100,000’s of skaters world wide would write and paint on their decks, grip tape, school folders and skate spots! Even today their music is featured in many skateboard documentaries and was even used in a commercial that aired during Superbowl 49. THE FACTION are quit alive and well and still playing out to this day!